Today’s Gadget is the Cast Iron Oyster Pan ! - Geaux Ask Alice! BlogToday’s Gadget is the Cast Iron Oyster Pan ! From Sur la Table which sells for $40. A PEARL FOR YOUR GRILL! 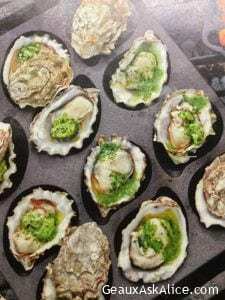 Even heat and delicious results—easily season, cook and serve up to 12 oysters on or off the half shell. You can make a most wonderful OYSTER BAR with a selection of toppings and let your guests create their own. previous post: Crazy for King Cake! !